San Diego Palm Tree Trimming, Removal, and Care Experts. 🌴Industry’s Best Palm Tree Trimming Techniques. THE HIGHEST QUALITY, MOST AFFORDABLE, PALM TREE TRIMMING SERVICES IN POWAY, DEL MAR, LA JOLLA, ESCONDIDO, AND SURROUNDING AREAS. 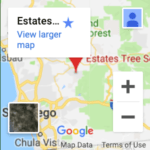 Estates Tree Service has been providing the highest quality Palm Tree Trimming services to San Diego County since 1992. Our goal is to ensure each and every one of our clients are 100% satisfied after we complete each job, we have achieved a BBB A+ rating, hundreds of 5-star reviews and we have serviced thousands of happy customers throughout San Diego. Our team of highly experienced Palm Tree Service experts has dozens of years of experience trimming palm trees in El Cajon, La Mesa, La Jolla, San Diego, Ramona, Fallbrook and the surrounding areas, no matter where you are in San Diego we will provide a free, no obligation, written estimate for your Palm Tree Removal, Trimming, Crown Reduction or other types of Palm Tree Care. Palm Trees require occasional maintenance in order to remain healthy and to keep that iconic look. Seed sacks and dead palm fronds require removal, due to their weight these pieces are known to fall off and cause damage or injury to anything in their path, the extra weight of these dead extremities can also be the cause of a weakened tree which will start to lean or topple over. Estates Tree Services is the best Tree Service company to call for your Palm Tree Trimming needs, we can perform crown reductions, crown raising, palm tree skinning and more of the services that will keep your palm trees happy and healthy for years to come. While becoming established and during their growing season it is essential to keep your palm tree happy and healthy by providing the nutrients that it needs. Consider using a fertilizer or palm food to help your palm tree become healthy and grow. 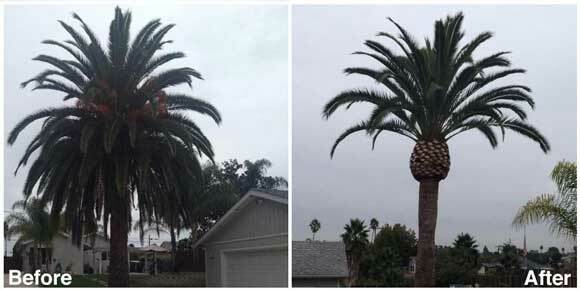 Palm Trees grow in San Diego due to our climate, at times in rural areas throughout San Diego County like Ramona there may be temperatures below freezing, if you really want to care for your palm consider covering the crown of the tree in order to prevent freezing. THE SAN DIEGO PALM TREE TRIMMING, REMOVAL, AND CARE EXPERTS. San Diego, California has a warm climate that is perfect for various types of palm trees, from the elegant Sago Palm to the very prevalent Mexican fan palm, no matter where you are in San Diego you are bound to see a palm tree. As palm trees grow the palm fronds begin to die and make room for new palm fronds to grow in their place, leaving unsightly dead palm fronds which are not only ugly but they can also be dangerous, keeping up with your Palm Frond Removal and Palm Tree Trimming is essential in order to keep your trees healthy so that they can continue to grow, it will also make your property more beautiful and improve curb appeal. Our expert staff is fully trained and equipped with all of the necessary equipment to reach even the highest palm tree’s, our 80-foot boom truck makes removing dead palm fronds and seed pods possible so that your property can be safe and look great. Whether you’re looking for Palm Tree Trimming at your home or business Estates Tree Company is the company that you need, we are proud to provide service to Residential, Commercial, HOA’s and Property Management clients for all of their San Diego Tree Service needs. Estates Tree Service is a top rated, Licensed, Insured Tree Service company in San Diego, Ca. We believe in putting the customers first and we guarantee 100% satisfaction with each and every job that we complete. When you contact Estates Tree Service for your Palm Tree Trimming needs we will come to your property, provide a free estimate, if you have any questions, need information on Palm Tree Care and Maintenance or want our advice on how to best care for your trees we will be happy to help. Our experienced and trained crew of Palm Tree Service experts will complete your job, leaving your property looking better, safer, and we clean up after ourselves, you will not be disappointed when you call Estates Tree Service at (760) 440-9138. We Trim Every Type Of Tree! Big, Tall, Hard To Reach, No Problem! Click here for more info on Tree Trimming in San Diego. Types of Palm Trees Found in San Diego. Estates Tree Services Palm Tree Services.